The story of the final years of Hemingway’s life have never been told with such eloquence and compassion. It’s been over 50 years since one of the greatest American writers of the 20th century put a shotgun barrel in his mouth and pulled the trigger, simultaneously ending a remarkable life and forfeiting control of a sizeable archive of unpublished works. In the years that immediately followed Ernest Hemingway’s suicide, his friend, sometimes-editor, and confidante A.E. Hotchner provided Hemingway’s widow, Mary, with a title for her husband’s yet-to-be published memoir of life in 1920’s Paris, A Moveable Feast. The remark was taken from a conversation with the author in 1950 in which Hemingway described his beloved former home. This conversation was immortalized in the first page of A Moveable Feast, attributed to Hemingway “in conversation with a friend,” the “friend” being, we now know, Hotchner. Hotchner’s new memoir, Hemingway In Love: His Own Story, must be read in the context of the author’s close relationship with his subject, his involvement in the publication of A Moveable Feast, and recent events in the Hemingway-verse that signify a battle over the narrative surrounding one of America’s most beloved authors. It's difficult for the Hemingway aficionado to approach Hemingway in Love without bearing in mind three books that came before: A Moveable Feast, Hotchner’s earlier memoir Papa Hemingway, and a 2009 “re-working” of A Moveable Feast, (in Hotchner’s view erroneously) subtitled "The Restored Edition". Hemingway In Love is a compliment to Hotchner’s earlier account of his friendship with Hemingway, Papa Hemingway, published in 1966. Papa Hemingway offers an overview of Hotchner and Hemingway’s globe-trotting adventures spanning the last 13 years of the author’s life. Hemingway in Love details Hotchner’s remembrance of the author’s account of his being torn between two women, his second wife Pauline, and, by Hotchner’s account the love of Hemingway’s life, his first wife Hadley, a tale that Hotchner withheld from including in Papa Hemingway back in 1966. Hotchner claims that, aside from the editorial pressure of his publisher, he omitted these crucial details and conversations from Papa Hemingway in order to avoid hurting the feelings of his friend Mary Hemingway; one can imagine a still-reeling widow might not enjoy reading about another woman imagined as “the only real love” of her husband’s life. However, it's important to note that this episode was alluded to by the author himself in the final pages of A Moveable Feast—or, at least it used to be. In 2009, Scribner published A Moveable Feast: The Restored Edition, consisting of numerous changes, additions, and omissions from the originally published version. Among the most egregious of these changes is a significant reworking of the book’s crucial final chapter, in which Hemingway hints at the heartbreak surrounding his affair with his second wife, Pauline, and his lingering regret about abandoning Hadley. A closer reading of recent events suggests that it was the “re-working” of A Moveable Feast that inspired Hemingway in Love, in addition to the author’s unwillingness to hurt or offend the “characters” in this period of Hemingway’s life, and the death of Mary Hemingway. Thus, it is this story—the dissolution of Hemingway’s first marriage as a new union with Pauline took form—that Hotchner felt moved to tell with Hemingway in Love, based on conversations with the late author spanning the final seven years of his life. The reader uninitiated in these recent events, or unfamiliar with A Moveable Feast or Papa Hemingway, will find much to cherish in the pages of Hemingway in Love. As Hotchner’s earlier memoir brought “Papa” to life, offering the reader an intimate glimpse into a special friendship and a complex man, the author has achieved a similar feat with Hemingway in Love, providing the reader with a fuller portrait of Hemingway, the vulnerable human being, as opposed to Hemingway, the machismo legend. In the opening pages, Hotchner explains that his primary “source material” for Hemingway in Love was withheld sections from Papa Hemingway, old notes from long-disintegrated tape recordings of conversations with Hemingway, and his “strong recall of what occurred and what was said” as “Papa” divulged the story of the most tumultuous romantic period of his life. The great strength of Papa Hemingway is the dialogue, containing lengthy, but always engaging transcripts of conversations presumably taken from Hemingway and Hotchner verbatim, or close to it. If there is one “flaw” with Hemingway in Love it's that much of Hemingway’s monologue lacks the feeling and rhythm of real conversation. The Hemingway that emerges from these pages is, on occasion, almost too voluble to be believed, perhaps illustrating Hotchner’s admission that he “largely relied on [his] own recall… in writing this book.” It has now been over 55 years since these conversations took place and, occasionally, the book reads as if the author took excessive creative license in his presentation of his friend’s remembrances. Still, Hotchner tells an engaging and harrowing story, beginning with the author and Hemingway in conversation over wine at a Venetian hotel, and concluding in a Minnesota psychiatric hospital seven years later, the now-paranoid and delusional Hemingway bearing little resemblance to the “Papa” of old. 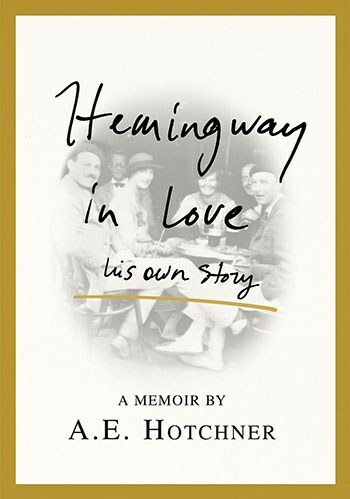 Hemingway is endlessly charitable and affectionate when writing about his first wife, Hadley, in A Moveable Feast, and this is reflected in his monologues in Hemingway in Love; he goes on to explain the “agony” of being in love with two women simultaneously, and how youth, immaturity, and professional success resulted in throwing away the love of his life. Hotchner’s memoir offers us something of a “behind the scenes” glimpse at how Hemingway was processing his past, and dealing with the lingering trauma of regret, physical pain, and his deteriorating creative ability and prolificacy as he struggled to finish work on A Moveable Feast. The story of the final years of Hemingway’s life have never been told with such eloquence and compassion, with Hotchner’s respect and admiration for his subject remaining constant throughout, even as Hemingway’s declining mental health made connection and conversation more and more difficult. It has become difficult to find the 1964 version of A Moveable Feast—to my knowledge, it’s currently not available in electronic format—and thus, one can imagine that Hotchner would feel a new sense of urgency and responsibility to share this story. As the author reminds us in Hemingway in Love, “time has filtered out” nearly every Hemingway intimate. Thus, it seems that the responsibility has been left to the 95-year-old Hotchner to ensure that his friend’s story is presented to the reading public as comprehensively as possible. Any reader concerned with the preservation of Hemingway’s legacy should be grateful for Hotchner’s contribution, and should heed his call to be wary of attempts to whitewash Hemingway’s thrilling, often tragic life story.